"I could seriously be on the verge of having a mental breakdown, but as long as I'm able to go skate, I'm completely fine." Hulu + Magnolia have released the first official trailer for a documentary titled Minding the Gap from director Bing Liu, one of the very best doc films this year. This premiered at the Sundance Film Festival year, where it won a Special Jury Award for Breakthrough Filmmaking; then it went on to play at tons of other film festivals, as shown in one of the title cards in this trailer. "The secret to growing up is that no one really knows what they’re doing. It's in the gap between childhood and adulthood that we find meaning for ourselves." 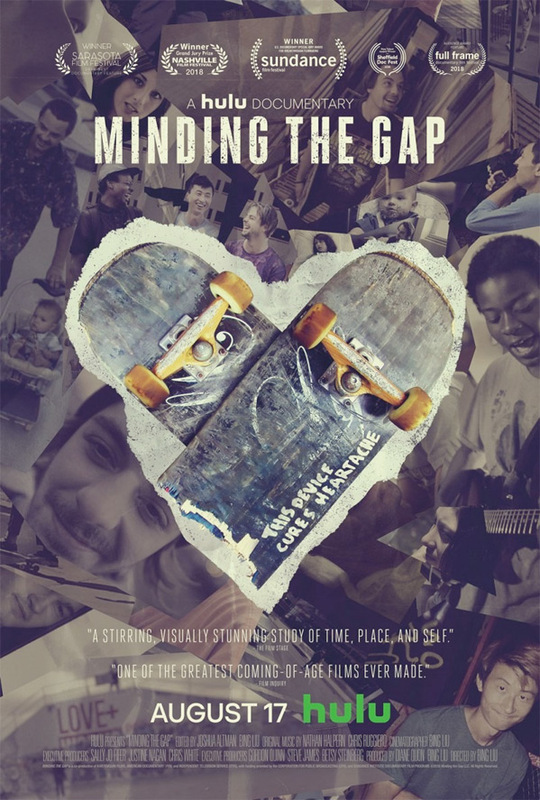 Minding the Gap is about three kids from Illinois, growing up fast and figuring out adult life, all the while cherishing the great freedom of skateboarding. I interviewed Bing Liu at Sundance after seeing the film, and wrote a rave review as well, praising it as "one of the most refreshingly original, engaging docs about growing up in today's America." I cannot recommend this doc enough. Watch below. Compiling over 12 years of footage shot in his hometown of Rockford, IL, in Minding the Gap, Bing Liu searches for correlations between his skateboarder friends' turbulent upbringings and the complexities of modern-day masculinity. As the film unfolds, Bing captures Zack’s tumultuous relationship with his girlfriend deteriorate after the birth of their son, along with their friend Keire struggling with his racial identity as he faces new responsibilities following the death of his father. While navigating a difficult relationship between his camera, his friends, and his own past, Bing ultimately weaves a story of generational forgiveness while exploring the precarious gap between childhood and adulthood. Minding the Gap is directed by up-and-coming filmmaker Bing Liu, making his feature directorial debut (read our interview with Bing here). This premiered at the Sundance Film Festival earlier this year, where it won the US Documentary Special Jury Award for Breakthrough Filmmaking. Magnolia will release Minding the Gap in select theaters on August 17th along with a Hulu debut. Read Alex's glowing review. First impression?